Have you ever wanted to paint a piece of art you can be proud of, but not sure where to start? We've had so much fun with our friends that tune in for our Let's Paint livestreams on Facebook over the years and have expanded on their desire to learn, making it as accessible and fun for all who are willing. We created an online educational painting program for everyone – from the not-so-confident beginner to the casual artist to the seasoned professional. Many of you are familiar with our monthly paint parties via Facebook livestream, but now you can really unleash your inner artist using the “Let’s Paint with FolkArt One Stroke” kit by Donna Dewberry. Accompanied by an interactive “how-to” series that is now on YouTube, Donna will break down her famous “One Stroke” method while demonstrating how to paint 12 new flowers – one for each month! 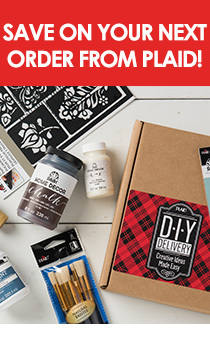 The kit includes 12 FolkArt Multi-Surface acrylic paint colors, the FolkArt One Stroke 10 piece beginner brush pack, FolkArt Floating Medium and Home Decor sponge, and 12 reusable teaching guides. From beginners to experts, anyone can Learn to Paint with FolkArt One Stroke! See the first video below for yourself. We have so much more in store for you as this educational program progresses. Be sure to visit our Let's Paint page for more info and updates. Stay connected with us on social where we are teaching, sharing and having lots of fun while painting! Use #PlaidCrafts #LetsPaint to share your creations with us.